Seems many of you missed getting your weekly dose of E News during the break – thanks for your feedback! Our Reverse Order Triathlon took place yesterday and was enjoyed immensely by participants, a real body and mind workout for all. Our sincere thanks to RD John Thyne who put this one together for us to enjoy. John was assisted by many fellow volunteers and we thank them all for their contribution to the success of this event. We need all our members to put their hands up to volunteer at least once each season & urgently require a couple of RD’s for upcoming November events. Unfortunately if those positions can’t be filled we may have to look at cancelling those events. Please see further info on how to volunteer below. Prov Results available on website. 1. To ensure our events are sanctioned and can go ahead, documentation must be submitted one month prior to event. 2. This includes the name of the Race Director. 3. We are urgently seeking volunteers for RD at two events in November (Sun 3 Enduro and Sat 30 Splash N Dash). 4. If we do not have an RD in place in time these events are likely to be cancelled. 5. We urge you to check our calendar on the website and nominate where you can help out. Our more experienced members are relied on to step up and take on the RD role (guidance can be provided if this is your first time as RD). 6. 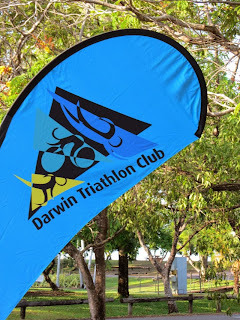 Darwin Triathlon Club has always had a strong volunteer culture and there is an expectation that all members will volunteer at least once during each season. 7. To be added, please email here with preferred date and roster position. 1. Our finalised event calendar for 2013/2014 is now up on our website. 2. Some changes have had to be made to accommodate sanctioning process and to take on board preferences following our recent member survey. 3. Please check the calendar regularly. 1. FOUND: Bike pump at Reverse Order. Please email if yours. 2. FOR SALE: A pair of women's carbon Shimano road bike shoes size 41. The latest type WT60 light weight and going for a good price. They have only been used once and still in excellent condition. The colours on the shoes are white, black and pink. The road bike shoes are selling for $160. Contact Jemima 0404 777 680. 1. Peter Eason (Alice Springs Triathlon Club) won M40-44 age category of the Australian Duathlon C’ships in WA yesterday. 2. Stef Puszka, Bryan Hopkins & Marcus Lisle have arrived safely on the Big Island for Ironman World Championships next weekend. 3. Also in Kona, former members Bob Martin & Robbie Andrews. 4. We wish our junior coordinator Luke Hansen a speedy recovery. Luke recently underwent surgery on his shoulder. 5. The issuing of individual timing chips is continuing – please remember to bring them to each event. We have now purchased a lap top to be used to process results and hope to shift to completely electronic results very soon. 6. The midges were fierce at Lake Alex yesterday. A reminder to BYO insect repellent. 7. Details of our latest uniform order will be forwarded later this week. This will be the last order for 2013.